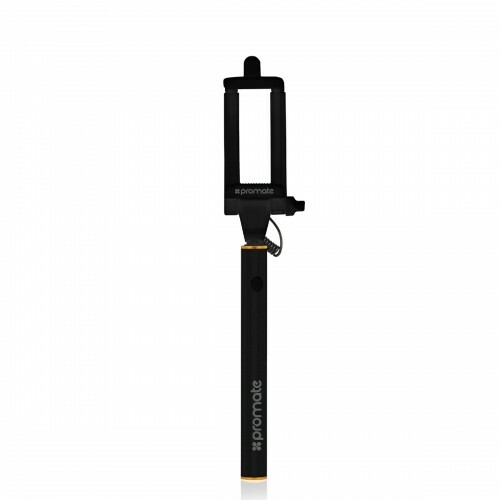 Click selfies wherever you go with this amazing extendable selfie monopod. Featuring a wired remote control, miniPod takes your selfie clicking experience to the next level. Easy plug-n-play, simply connect the 3.5mm cable to your device and click amazing selfies. Extendable up to 62cm, miniPod is surely a product you do not want to miss upon. Taking the perfect selfie isn't as easy as it would seem. Our arms are only so long, which means you can miss out on not just the surroundings, but even the people you wish to feature. Thankfully, we now have a method of capturing the perfect selfie, ensuring 'everything' and more importantly 'everyone' is within the photo for all of you to enjoy that special once in a lifetime moment. No need to strain when stretching your arms, simply attach your phone to the secure holder and expand the Selfie Pole. With your shot positioned exactly how you want it, you are ready to take an image. Using your phone's headphone port, the Promate miniPod Selfie Stick doesn't require Bluetooth technology or pairing to your smartphone - simply plug into your phone and take a photo within seconds. The Promate miniPod Selfie Stick has no battery due to the way it connects to your smartphone. This means your Promate miniPod Selfie Stick never runs out of charge and is always ready to capture those all-important selfie moments. You can't carry a pole around with you all day... or can you! Well actually, yes you can thanks to the Selfie Pole's retractable design. Extend or retract the pole, making it the perfect accessory to carry around with you for when the perfect selfie opportunity arises. In fact, the Promate miniPod Selfie Stick is so portable - you can even place it within a handbag! With your phone positioned further away, you need a straightforward method of telling the software to take the image without having to stretch needlessly into the distance to reach your device's screen. The Promate miniPod Selfie Stick features a built-in button that with one press instructs your phone to take an image. The Selfie Pole features safety locks, enabling you to position the extendable pole and the smartphone perfectly and securely. It is Compatible with smartphones between 55mm - 90mm in width. You can also leave the case on your phone as you mount your device on the Selfie Pole. Compatible with all but the most chunky of cases, the Selfie Pole is ready for action whether your case is on or not. Compatible with both Android and Apple devices, the Selfie Pole is the ideal companion for your selfie photography needs. Beats X 5 Minutes of Charge = 2 Hours of PlaybackWith Fast Fuel..
JBL Reflect JBL Signature SoundThe world renowned JBL soun..